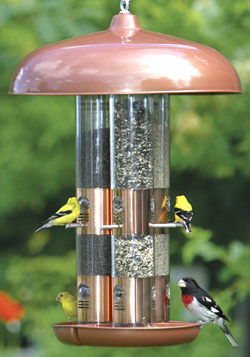 The Triple Tube feeder was designed to make feeding backyard birds easy. It’s very simple to load: spin the plastic hood, remove it, and then pour the seed into the three separate tubes. Fill one tube with sunflower seeds, another with wild bird seed, and the third with large nutmeats to attract the widest variety of birds. Spin the hood back onto the top and you’re in business. The 12 feeding ports (four per vertical tube) and the round fold-down doors are the key features on this feeder. The door hole is large enough for most medium sized birds, such as sparrows or jays, to access the seed when they are open. When the doors are closed, a small hole in the center restricts feeding to small-billed birds, like the nuthatches and wrens, very useful when the local sparrow or starling population discovers your feeder. These gluttons can devour an entire tube of seed in a single day. Some of these species are smart enough to peck at the door to open it, but the doors snap shut making unauthorized opening difficult (though some persistent jays may figure out how to open them). The Triple Tube feeder is well constructed, made of acrylic, polystyrene, and metal clad. The polystyrene hood is designed to keep squirrels from raiding the seed – the marauders slide off of it as they try. A small plastic tray at the bottom of the tubes catches most of the discarded seed, but some seed does end up on the ground. This feeder is designed to withstand wet winters and hot summers. This feeder is fairly easy to clean. This feeder isn’t the easiest unit to clean, but it’s not impossible once you snap off the bottom tray and soak it in a 1:10 diluted solution of bleach and water. Remove the cruddy build-up at the bottom of the tubes with a long, stiff wire brush purchased at any hardware store. This feeder is easy to assemble, and the top features a large hook that can be attached to a branch with a metal hanger. Assembly consists of snapping on the bottom tray and inserting the small metal pegs (perches) into the holes under the feeder ports. Baffles below each port prevent only small clinging wrens and nuthatches from feeding if you choose to remove the perches. Birds Attracted: Most songbirds, wrens, nuthatches. Summary: Fill your feeder less frequently with this large-capacity, easy to use tube-style feeder. The sliding port doors keep out the sparrows, and the hood successfully blocks squirrels. The triple tube style allows you to feed three different types of seeds to attract a wide variety of birds. Capacity: 10 lbs of seed. Size: 24 inches high, 12 inches diameter. Sliding feeder doors can be used to restrict sparrows and large birds. Holds three different types of seed. Seed may become damp and sprout at the bottom. Top is plastic, not metal as it looks in the photo.